CAIRO • A body part, seats, luggage and other personal belongings of passengers aboard an EgyptAir plane that crashed were found yesterday, marking the first breakthrough in investigations into what caused the jet to plunge into the Mediterranean Sea off the Egyptian coast in the early hours of Thursday. All 66 people on board, including seven crew members and three security personnel, perished. Egypt has been leading the search effort, with support from France, Greece and Turkey. The United States Navy dispatched a P-3 Orion maritime surveillance aircraft from a base in Sicily. After news of the find was released yesterday, Egyptian President Abdel Fattah al-Sisi expressed his condolences to the families of victims who were on board the flight. "The presidency, with utmost sadness and regret, mourns the victims on board the EgyptAir flight who were killed after the plane crashed in the Mediterranean on its way back to Cairo from Paris," Bloom- berg quoted a statement from Mr Sisi's office as saying. President Tony Tan Keng Yam and Prime Minister Lee Hsien Loong have written to their Egyptian counterparts to offer their sympathies in the light of the disaster. Aviation analysts are noting a troubling coincidence among three aviation disasters at sea - that contact with the flight was lost at the point of hand-off between air traffic control authorities. 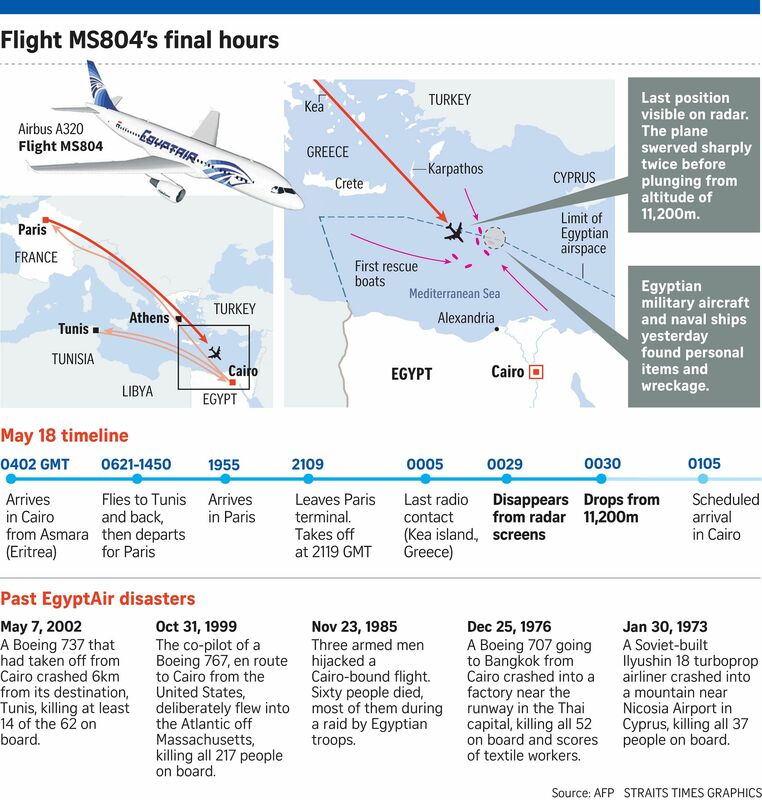 • EgyptAir Flight 804 was leaving Greek control and entering Egyptian control when it went down. • Air France Flight 447, which crashed in the Atlantic in 2009, was passing from Brazilian airspace to Senegalese airspace. • When Malaysia Airlines Flight 370 veered off course and disappeared in 2014, it was being handed off from Malaysian to Vietnamese ground controllers. In all three cases, analysts noted, the aircraft were cruising normally at the time of last radio contact, and never issued a distress call. As there were many French nationals on the doomed flight, they also sent similar messages to their French counterparts. The authorities have so far not ruled out any possible cause for the crash, including a deliberate act or malfunction, though Egyptian Minister of Aviation Sherif Fathy has said the possibility of a terrorist attack was higher than a technical failure. No group had claimed responsibility more than 24 hours after the incident. Greek Defence Minister Panos Kammenos on Thursday told reporters that the Airbus A-320 had swerved sharply twice in Egyptian airspace before plunging 6,700m and disappearing from radar screens. Yesterday, Mr Kammenos said Greece could not speculate on the reasons for the crash. The pilots sent no emergency distress signal and officials from multiple US agencies told Reuters that a preliminary examination of satellite imagery had not shown any signs of an explosion. The anonymous sources said the US had not ruled out any potential causes for the crash, including mechanical failure, terrorism or a deliberate act by the pilot or crew. Mr Mike Vivian, former head of operations at Britain's Civil Aviation Authority, told the BBC he thought the plane's swerves before dropping off radar were more likely to be caused by human interference than by a bomb. "It looks highly unlikely that this was consistent with some sort of explosive device," he said. "One's inclined to go towards the theory that there had been some interference in the aircraft and on the flight deck, with the control of the aircraft." Amid uncertainty about what brought down the plane, Los Angeles International Airport became the first major US air transport hub to say it was stepping up security measures. Salvage crews will now no doubt focus on retrieving the flight and data recorders, the so-called black boxes. Several factors come into play when searching for wreckage in an ocean. Sea currents, weather and the speed at which the jet hit the water are some issues to be taken into consideration, said Mr Ken Mathews, a former accident investigator who has worked with the US National Transportation Safety Board. "If they narrow down the likely area, then it's only a matter of time," Mr Mathews said. "The Mediterranean is not a vast area, or so deep as an ocean."